If you’ve been following my blog you’ll know that I don’t like spending when I don’t have to. Hobbycraft have always got special offers on, like these fat quarter bundles for half price. There are usually special offers on sewing machines, worth a look whether you’re looking for yourself or thinking of a gift. Sewing kits are a great way of encouraging children to start sewing. 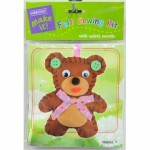 You can make up your own kit or go for something like this cute bear, cut out and ready to sew. You really are spoilt for choice and I have to keep a firm reign on the credit card when shopping for sewing supplies online at Hobbycraft! It’s easy to navigate with an intuitive search facility. Pages are fast to load even with my rural broadband connection. You can join the Hobbycraft Club and get 15% off your first order with special deals delivered to your inbox. There are guides to help make informed choices, for example, there’s comprehensive sewing machine guide. All orders have a freepost return slip in case there’s something wrong with your order. On the odd occasion I’ve needed to use this it’s been a straight forward process with refunds or replacement goods delivered in a timely manner. I’ve never contacted them by phone but it costs the same rate as a local call It’s free if your landline or mobile tariff includes free calls to local rate numbers. Emails have always been answered promptly. 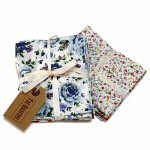 Popular items sell out quickly and stock can take a while to come back in. Some haberdashery items can be on the expensive side. If you’re looking for sewing supplies online then Hobbycraft is the place to go. They cover most hobbies, not just sewing and they are at the top of my list for cheap craft supplies. Head over there and get crafting!